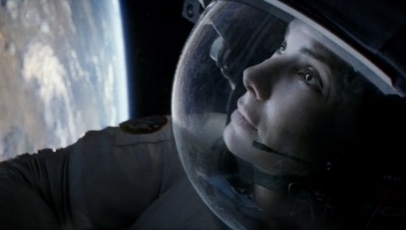 The culmination of several years of hard work (the film was originally conceived back in 2006), Gravity is an electrifying amalgamation of awe-inspiring visuals, technical innovation and a terrific central performance. Bringing together director Alfonso Cuarón and his son and co-writer Jonas Cuarón, this is a survival story like no other, set against the beautiful, infinitely desolate backdrop of space – one that, in a particularly huge win for IMAX, immerses its audience entirely from start to finish. In space on a routine mission to fix the Hubble telescope, medical engineer Dr. Ryan Stone (Sandra Bullock) finds herself and her fellow astronaut Matt Kowalski (George Clooney) in unimaginable danger when debris from a destroyed Russian satellite collides with – and ultimately shatters – their own space shuttle. Sent hurtling into the depths of space, isolated from her colleague and the rest of civilisation, Stone’s survival instinct is forced to kick in. But with oxygen levels running low, she must work quickly if she has any chance of staying alive. There’s not a lot else to what’s a simple and arguably fairly rote narrative, though that doesn’t stop Gravity from being the extraordinary feat it is, and one that takes your breath away at every corner. From a breathtaking, unbroken opening sequence that bestows a false sense of ease through seemingly unshakable technical jargon and humorous dialogue (Clooney is well cast as the wise-cracking optimist), the film quickly erupts into a relentless thrill-ride that pushes Ryan to hell and back. Cuarón depicts space as both a place of awe and a void of irremediable desolation through realistic imagery and stunning, like-nothing-you’ve-ever-seen-before CGI wizardry that only adds to the palpable tension simply oozing from the screen onto the baying audience. The more the brisk, uncompromising 91 minute run time ticks away, the slimmer Ryan’s chance of survival becomes, and the more she’s forced to look inside herself and decide which psychological response to follow: fight or flight. Bullock’s performance is what acts as the films true foundation and thrust, however. As Ryan, she’s mesmerising, managing to convey both dread and wonderment at the same time. Her expressions, reactions and actions are enough in themselves to draw the audience in, while the visuals, immense depth of field and, in particular, the sounds (from the haunting quietness during long shots to the agonising terror heard through Ryan’s hurried breathing during the intense close ups) are the topping on what is – literally and figuratively speaking – a film that’s out of this world. I wasn’t particularly excited about this film and I only watched it because of the hype surrounding it. The visuals were absolutely stunning and like nothing I have seen before , this being said, I left the cinema very underwhelmed by it. The storyline was very simplistic, which is not always a bad thing, but I just found that there was very little to keep me hooked. I never felt that Sandra’ s character would die although I can’t see how she survived? It didn’t seem particularly realistic and although it was a good performance from Sandra Bullock I think Tom Hanks’ performance was far superior in Castaway. I think I am pretty much on my own on this opinion of the film. Not at all – I’m in the same boat as you. I thought it looked beautiful, and Bullock gave a really solid performance. But, story wise and script was, I was completely blown away by how much I didn’t like it. I was really prepared to like it, too. I felt like we didn’t get enough early characterization – I had no willing suspension of disbelief. Which was upsetting, because the crazy illogical stuff that happened looked beautiful. Glad I’m not the only one! I just hope that the oscar judges see through the visuals and reward 12 years a slave and American Hustle. I actually didn’t like American Hustle either, and I’ll be really upset if it wins. I thought it was good, and it definitely deserves the acting ensemble awards, but it just didn’t do it for me. I’ve never been a particularly big fan of David O’Russell – his style just doesn’t mesh so well with mine. [Another reason why I was particularly put off my gravity: I usually love Alfonso Cuaron.] Christian Bale gave the best performance in the group, I think. I was glad when he was nominated. I really feel like it’s going to be one of those weird years where the movie that wins most of the Oscars does not win Best Picture, the movie with the most nominations doesn’t win anything, and the little movie that’s only expected to win 2 will somehow win best picture. It’ll be interesting to watch.